London, England, Aug 10, 2012 / 04:25 pm (CNA/EWTN News).- Ethiopian athlete Meseret Defar provided one of the most emotional moments of the London 2012 Summer Olympic Games when she crossed the finish line in the 5000 meter race to win the gold. She then pulled a picture of the Virgin Mary out from under her jersey, showed it to the cameras and held it up to her face in deep prayer. Throughout the event, Defar kept pace with three other Ethiopian runners and three from Kenya, until speeding past them on the homestretch to win gold. The silver medal went to Vivian Cheruiyot of Kenya and the bronze to Dibaba. Defar is also a two-time world champion in the 3000 meters. In Athens in 2004 she won the gold in the 5000 meters and in Beijing in 2008 she won the bronze. On June 3, 2006 she broke the world record for the 5000 meters set previously by Turkish runner Elvan Abeylegesse, with a time of 14:24:53. If you want a similar icon , here it is. Is that the same woman as this one? People can click on it to read the whole article. I'm sure next time AZCatholic will remember to provide the link. I believe this is the exact icon that she is carrying (attached). I was very touched by what she did! They say the olympics is watched by over 3 billion ppl world wide and to pull out St Mary's icon in front of that is bravery to me! God bless her for making us all proud! It was absolutely beautiful to see, I thank God I lived to see such a day! nothing the other Ethiopian athletes could have done have eclipsed it, and it was to be so. she went back to her country men having been the one who glorified the Theotokos and her Beloved Son before the whole world! my beautiful fierce sister radiant in her tears of gratitude and adoration as she lifts up the icon of the Virgin with her Beloved Son saying behold to whom belongs this moment of glory. to her Orthodox brethren, she preached strength in Faith, What honor it is to give honor to God in all things.seeing that moment, some have prayed that they may finish the race of this life holding the Theotokos and Her beloved Son so close to their hearts, and openly before the world as well.even prior to this event Meseret after her world record setting win she has given the gold medal she won to the Holy Trinity Church, she is an amazing Orthodox Christian Woman .May the Lord grant her many healthy, peaceful and joyous life amen. This Icon is called the Icon of the Incarnation not Theotokos, Yes it does include the Theotokos and Christ but it depicts the Incarnation. Any Icon that depicts Christ as a Child symbolizes the Incarnation of the Lord in the Orthodox Tradition. It does indeed depict the Incarnation of the Lord, but that particular icon in the Ethiopian tradition is called ' siele Maryam Dingil misle fiqur welda' / the Icon of the Virgin Mary with her Beloved Son/ or in short' misle fiqur welda'/ with her Beloved Son'. the Theotokos is rarely depicted without her Son in our traditional iconography, we have a prayer dedicated to venerate her icon,' melka siel' the entire theme of the prayer is replete with who she is: in her relation to her Son and to us. All Icons depict the Incarnation of our Lord, I hope you understand I am not disagreeing with you in the main point. 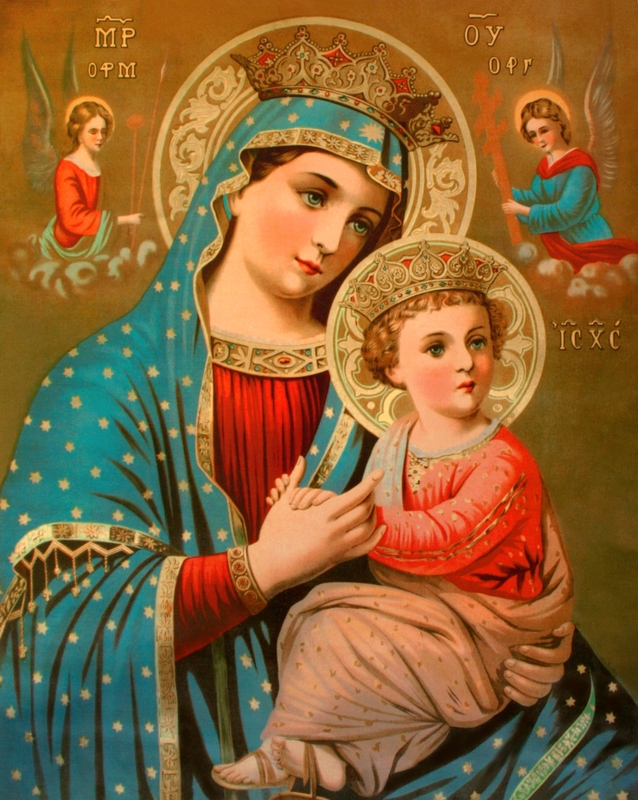 we have an Icon of the Nativity of our Lord, it is not the one the athlete was holding up so to the Ethiopian Orthodox looking at it, that is very much the Icon of the Most Holy Theotokos with her Beloved Son.